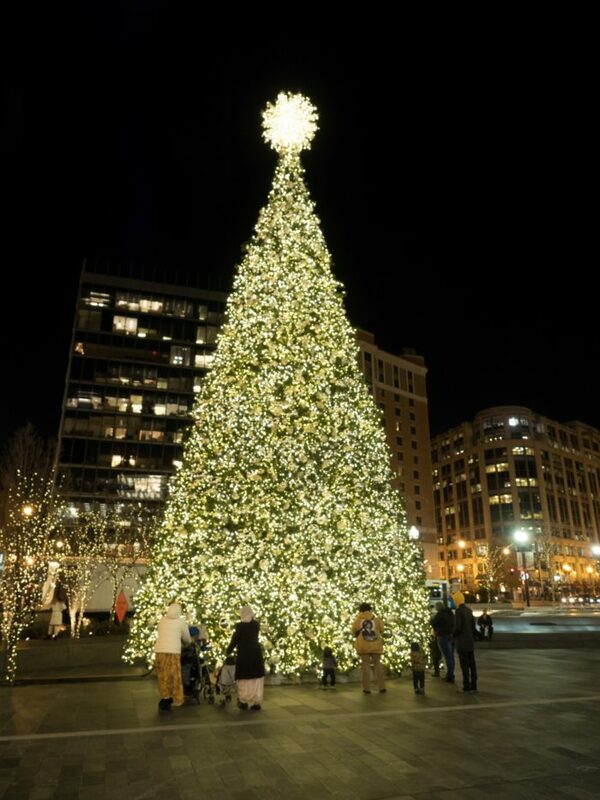 Destination DC (DDC), the official destination marketing organization for Washington, DC, helps visitors craft magical holidays in the nation’s capital. Find inspiration for memorable getaways on DDC’s holiday landing page onwashington.org, and its Instagram and Facebook channels, including festive hotel packages, menus, holiday lights, ice skating rinks, gift markets, can’t-miss exhibitions and events across the city’s welcoming neighborhoods. “Washington, DC goes all out for the holidays. Maybe your wish-list includes meeting Santa, light displays and a classic holiday show. It might include visiting the National Museum of African American History and Culture, shopping for made-in-DC gifts then dinner at one of DC’s 15 Michelin-starred restaurants. We’ll connect you with the real DC,” said Elliott L. Ferguson II, president, and CEO of DDC. Twirl around the National Gallery of Art Sculpture Garden’s rink, November-March. Warm up inside the Pavilion Café. Rent skates at riverside rinks at The Wharf, Georgetown and Capitol Riverfront. Iceless skating rinks return to the courtyard at the Fairmont Washington, D.C. Georgetown and atop the Watergate Hotel. George Washington’s Mount Vernon celebrates with Colonial dancing, chocolate-making and caroling, Nov. 23-Dec. 31. Candlelit tours run Nov. 23, 24, 30; Dec. 1, 7, 8, 16. Holiday in the Park thrills Six Flags America with lights, rides and s’mores: Nov. 23-25, Dec. 1-2, 8-9, 15-16, 21-23, 26-31. The Downtown Holiday Market runs Nov. 23-Dec. 23 in Penn Quarter. Source more local gifts at Shop Made in DC in Dupont; Union Market in NoMa; Brookland Exchange at Monroe Street Market and Steadfast Supply in Capitol Riverfront. CityCenterDC dresses up with two monumental reindeer, an overhead installation in Palmer Alley and holiday tree lit on Nov. 24. Georgetown Glow, an outdoor light art exhibition, illuminates the historic district between 5-10pm, Dec. 1-Jan. 6, 2019. The Kennedy Center hosts shows including The Second City’s Love, Factually (Dec. 4-31), Washington National Opera: The Lion, the Unicorn and Me (Dec. 14-16) and the National Symphony Orchestra’s Handel’s Messiah (Dec. 20-23). At Warner Theatre, the Washington Ballet’s Nutcracker recasts the classic in the Lincoln White House (Nov. 29-Dec. 28). Richly dressed, A Christmas Carol (Nov. 15-Dec. 30) cheers Ford’s Theatre. Circle around outdoor firepits at Masseria near Union Market; Bourbon Steak in Georgetown and Tavern at Ivy City Smokehouse, a 2019 Michelin “Bib Gourmand” pick. Indulge in holiday teas at Peacock Alley at the Willard InterContinental Washington, DC; the Empress Lounge at the Mandarin Oriental Washington, DC; Tea Cellar at the Park Hyatt Washington DC and the lobbies of the St. Regis Washington D.C. and Line DC. Among tempting New Year’s Eve options, humanitarian and Michelin-starred chef José Andrés offers tasting menus at China Chilcano, Jaleo and Oyamel. Toast the season with “Caviar and Champagne” at The Darcy. This package bundles late check-out, a welcome Taittinger toast and decadent caviar cookies from Siren, the in-house Michelin-starred restaurant. Rates start at $169, thru Feb. 28, 2019. This December, Kimpton’s 10 boutique hotels in DC spread cheer with pop-up shops curated by Shop Made in DC, a retail incubator showcasing local makers. Book a “Make a Getaway” package to receive a swag bag and $15 gift card. The historic Willard InterContinental offers a Wintertime Holiday Package that wraps upgraded accommodations, $50 food and beverage credit and official 2018 White House Christmas Tree Ornament, starting at $299 (two-night min. ), Nov. 16, 2018-Feb. 16, 2019.